Dora The Exployer- Introducing DIEGO for the Boys! My 18 month old Grandson loves this movie and he's always watching it. He likes the show, but he was really excited when they added Diego since I guess it gave him someone to relate to better. Some reviewers MAY mentioned that They didn't like the fact that they added a boy because there are not many shows out there that show strong girls just for girls. I don't see what the big deal is though. They are little kids who are just watching a show to have a good time. I'm all for little girls being empowered by watching Dora - but I'm not going to leave it up to the cartoon to do it for her... So what if they add a little boy to the show. I'm the one that's going to be teaching her how to be a strong, independent woman. Not Dora. They love watching Dora and Diego and Boots go on their adventure to save the baby Jaguar that is calling for help. I'm glad they added a boy to the mix! I think that it teaches kids that there doesn't have to be a difference between boys and girls! I recommend it! Excellent children movie kids and parents love it!! My kids love dora and diego,kids love the movie and parents do too!! it's fun educational exciting my kids and probably all kids are glued to the t.v. watching these fun characters who sing songs and go on adventures play games it's just wonderful!! you have got to get it,you will love it your kids will love it and sometimes you will catch yourself singing "go deigo go" or "back pack back pack" I can't get it out of my head it's so worth it!! thanks and enjoy!! The intro of Diego to the Dora story line has 4 episodes of the hit kid's show. It is engaging and apparently completely enthralls 2 year olds! Dora and Diego save baby jaguar, then take a penguin home to the south pole. The other 2 episodes are both bonus shows. A must have for any Dora/Diego enthusiast! These DVD's are not only fun but are encouraging. They educate the child in the right treatment of people, animals and our earth.. The also teach a good self-image and how to have fun with physical activities, and the right foods to eat. 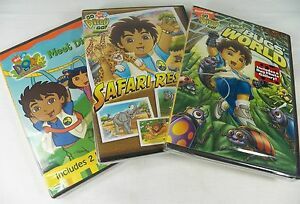 I realy love these DVD's and have bought them for my grandchildren. I even watch with them and do the activities to have time with them.